He was a model of correctness and propriety, and when his daughter told him that she wanted to marry a young reporter, he at first refused his consent. Later he relented, but it must be admitted that he still had forebodings. They were fulfilled one day, for his son-in-law-to-be became, as he regarded it, notorious. The young man endeavored to interview one of the city's financial lights, was arrested for attempting to take the great man's portrait, and rival reporters wrote it up as a great joke. His explanations that he had been immediately set free were lost upon the prim old man, who declared that technically he was a jail bird, and that there was absolutely no excuse for any person to fall into the hands of the police. One morning a few days later, the stern parent went out for a stroll. Around the corner galloped an excited individual, who thrust a watch and chain into his hand and then rushed off. The recipient started after him, and the next moment was pounced upon by several men who claimed he was a daring pickpocket, who had been plying his trade in the streetcar. Explanations were laughed at, and the respected householder was marched to the station. There he was photographed for the rogue's gallery, inspected by masked detectives, and underwent all of the trials and privations of the third degree. Fortunately for him the reporter dropped into the new station, and curiosity led him to request an interview with 'the daring pickpocket.' The meeting was a shock to both of them, but the prisoner speedily found the advantage of having a newspaper man in his family. His explanations were listened to, and the real criminal was speedily captured and the respectable citizen set at liberty with profuse apologies. 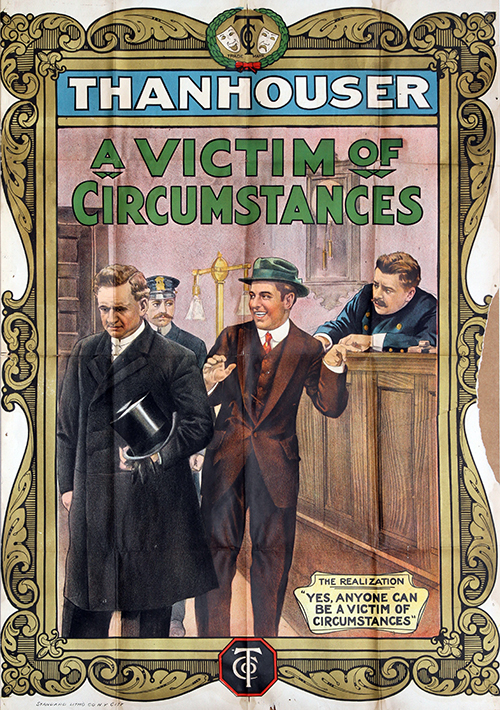 He had learned his lesson, however, and withdrew all opposition to his daughter's marriage, telling the young couple that he now knew that even the most innocent man may be a victim of circumstances. The comedy element in this film is quite strong, a reversal of conditions bringing about a comic situation that has been quite well developed. The story is of a young woman whose father refused to allow her to marry the man she loved because for some trifling reason he landed behind the bars. Later the girl's father gets in the same boat, and when the affair is settled he comes to his senses and gives his blessing to the young people. This is a very good comedy offering. The prominent man finds out how easy it is to be wrongly suspected of crime. He is thrown in jail and his photographs and Bertillion measurements taken. The young reporter who loves his daughter saves him. An amusing offering. An improbable story rather well done. It was evidently devised to show prison methods of photographing criminals and of the fingerprint identification system and is fairly entertaining. A reporter is taken to the police station when he attempts to take a picture of a financier. When the sweetheart's father reads that the young man 'lands behind prison bars,' he bans the reporter as a suitor. Later the father is arrested by mistake for a thief, but is saved when the reporter identifies him. So he realizes that mistakes can be made, and forgives the young man. It is improbable in the first place that the reporter would be taken to the police station for attempting a picture, and later improbable that the father would be arrested for a thief and identified by the victim, although in reality he in no way resembled the real criminal. The reporter was released immediately upon being taken to the police station, and yet the flashed newspaper story says that the young man 'lands behind prison bars.' The picture is good in direction and photography. Mignon Anderson is the sweetheart.